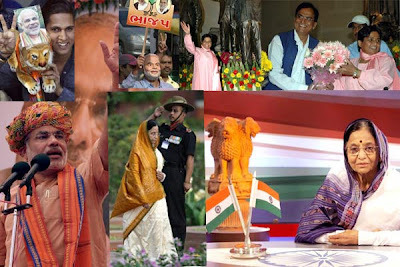 हरेक श्रमजीवी के श्रम से मुस्कुराती हैं "भारत - माता " वँदे मातरम !! गिर कर उठने की क्षमता की ! "नरेन्द्र " : Association with All India Congress Committee : I greatly cherish my brief but intimate association with Narendra Sharma He was with me in the A।I।C।C। Secretariat at Allahabad in the late thirties। He was in charge of its Hindi department even though Hindi or Hindustani had yet to get its due place in the Congress scheme of things।It is good to recall the political environment for Hindi when Narendra assumed the responsibility। Most of the A।I।C.C. work was done in English despite Gandhiji's stress on Hindi or Hindustani.The working committee of the Congress carried on its deliberations mostly in English.There was, of course, the outstanding exception of Maulana Azad. The other exceptions were Khan Abdul Ghaffar Khan and Seth Janalal Bajaj whenever they chose to express themselves on any issue.Gandhiji, at times, spoke in Hindi but he was often prevailed upon to speak in English. It was important and necessary that each member of the working committee understood correctly what Gandhiji meant.Further, all the proceedings of the working committee and the A.I.C.C. meetings were in English. There was however one important change. In the A.I.C.C. deliberations and the deliberations of the annual open session, there was a growing number of Hindi and Urdu speakers.It was in this set-up that we had Narendra Sharma in charge of the Hindi department. We were all happy with him. It fell on him to translate all Congress resolutions and the A.I.C.C. circulars in good effective Hindi.Congress resolutions in those stormy days carried great weight. They did not just contain Congress decisions on issues of the day. They were, in not a few cases, a clarion call to the nation to be ready for a grim trial ahead and a source of inspiration not only to congressmen but to millions outside the formal congress register.At all A.I.C.C. meetings it was important that the Hindi knowing members had the Hindi translation in their hands along with the original English version.It was Narendra Sharma's task to produce quick translations and he did it with ease and without fail. There was also some correspondence in Hindi which Sharmaji handled for the period he was in the A.I.C.C. Secretariat.He would have been with us a few years longer but with the coming of Industrial Civil Disobedience Movement and the1942 final struggle for freedom the working of the A.I.C.C. office was thrown into some kind of turmoil.Narendra Sharma was a poet in the making when he was with us in the A.I.C.C. Secretariat.Association with the A.I.C.C. in those days meant active association with India's struggle for freedom and experience in prison life if not anything more extreme.Narendra was ready for this experience but he had a wide range of interests. He had pronounced literary tastes. He had contacts with literary figures in Allahabad, Sumitranandan Pant and he lived under the same roof. In Pant, he found a perennial fountain of inspiration. These two were kindred souls, the elderly Pant treating Narendra almost as his son".Poet, late Pandit Narendra Sharma, was arrested without trial under the British Viceroy's Orders, for more than two years. His appointment to AICC was made by Pandit Jawaharlal Nehru.Pandit Narendra Sharma's photo along with then AICC members, is still there in Swaraj Bhavan, Allahabad.Call of 'the Nation':2.On 3rd October 1957, at 10.30 a.m. Government of India, under the Ministry of Information and Broadcasting, All India Radio [AIR] started 'Vividh Bharati'; Poet, late Pandit Narendra Sharma not only conceived, planned and programmed but also named both Vividh Bharati and all its programs, including but not limited to Hava Mahal, Chaubara, Gunjaan, Bela Ke Phool, Jai Mala for the 'Jawans'.Here it need not be mentioned that 'Vividh Bahrati' has brought in thousands of crores of revenue, name and fame to the Government of India.After the Chinese aggression on India and after Pandit Jawaharlal Nehru's death, Pandit Narendra Sharma, stayed on with Vividh Bharati as it's Chief Producer, politely turning down an offer to teach Indian Culture and Hindi at the Berkeley University, California, USA, as Smt. Indira Gandhi, then I&B Minister, asked him to stay on, in the country's interest. इस आलेख के लिए बहुत आभार. स्वतंत्रता दिवस की हार्दिक बधाई एवं शुभकामनाऐं. खुलेँ, चिर आत्म बोध के बँद द्वार! ..
पंडित जी के शब्दों के लिए बहुत आभार! स्वतंत्रता दिवस के अवसर पर हार्दिक बधाई एवं शुभकामनाऐं! स्वतंत्रता दिवस के इस पवन पर्व पर सभी ब्लॉगर मित्रो को हार्दिक बधाई एवं शुभकामनाऐं. रचनाएं नही हैं बल्की हस्ताक्षर हैं ! aap bahut hi shrm aur urjaa ke saath lekhan mein rat hain. modi aur gandhi dono gujraat se hain lekin jahan gandhi ji bapu kahlaye aur desh-dunya mein logon ke nayak-adarsh huye. wahin modi khalnayak hi hain ab tak. mumkin hai aapko bat atpati lage. अटपटा लगे... पर आज भारत के यही तो नेता हैँ! पली बडी हुई और मेरे पुरखे भारत की मिट्टी मेँ समा गये हैँ !